From this source. Posting again for your reference. 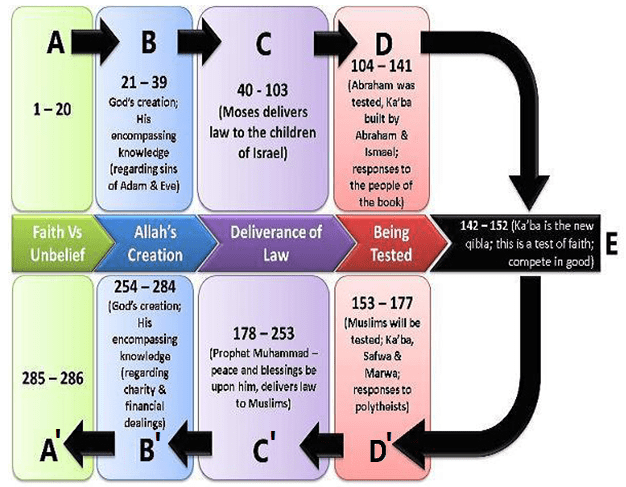 Although I had originally endeavored to cover the whole first half, I found it better to stop within the content of section D. The chart above doesn’t do full justice, as this section is more about asserting the authority of Muhammad as prophet*, the legitimacy of Ishmaelites/Arabs as heirs of Abraham, and the failures of the People of the Book (Christians and Jews) to preserve and understand God’s revelation within their own history and in Muhammad’s teachings. Again, this post will probably make the most sense only if you read the entire surah, as the material is scattered and I can’t follow the themes without jumping through the whole chapter. Otherwise today I’ll cover on ayat 94-203, approximately. The first chapter of the Quran is a light and short reading, and appropriately called Al-Faatiḥa, “The Introduction.” It is a prayer and a psalm, from the speaker to God. Firstly, I must start this post with a shame-faced admission that the resource I found most helpful when researching the structure of the Quran turned out to be…Wikipedia.